Looking into the rock crystal surfaces of this pendant, one sees the meltingly sweet face of the Angel Gabriel looking down upon the beautiful and expectant face of the Madonna, who lifts up her head to receive his message. 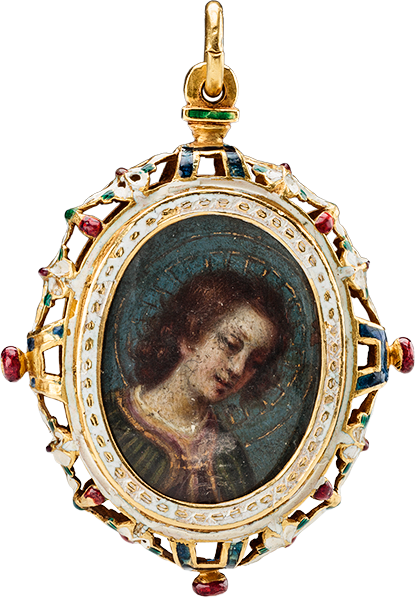 This remarkable object is one of a series of precious gifts commissioned by the Medici archdukes to be awarded to high-ranking recipients in Catholic strongholds across Europe as part of a sort of special “image diplomacy.” The portraits of the two holy persons are copied from a miraculous and miracle-working fresco in the Church of the Santissimi Annunziata in Florence and, as copies of the icon, are conceived as sacred matter. This pendant has been attributed to Valerio Marucelli, active at the end of the sixteenth through the beginning of the seventeenth century. Marucelli was a specialist in miniature painting. The pendant is worked with meticulous craftsmanship, beautiful fine brushstrokes in oil applied to a copper surface (painting on metals was common in court settings). The gold and enamel case was created by a master goldsmith—one of the series is recorded as by a German metalworker, although this work is closer to Spanish examples.